The IRIS 8 Panels Exercise Plastic Pen is ideal for in-home use as well as outside in your yard, for over 21 square feet of space for your pal. 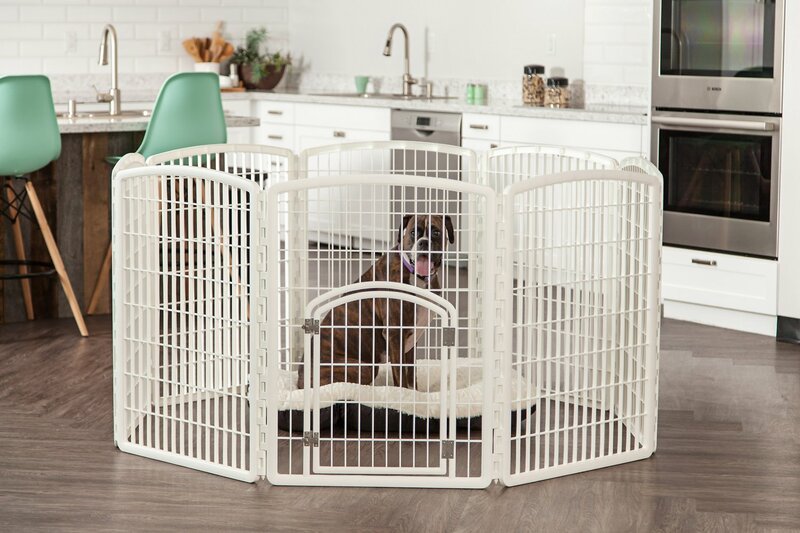 Perfect for small, medium and large size pets, this paw-some playpen has multiple uses! 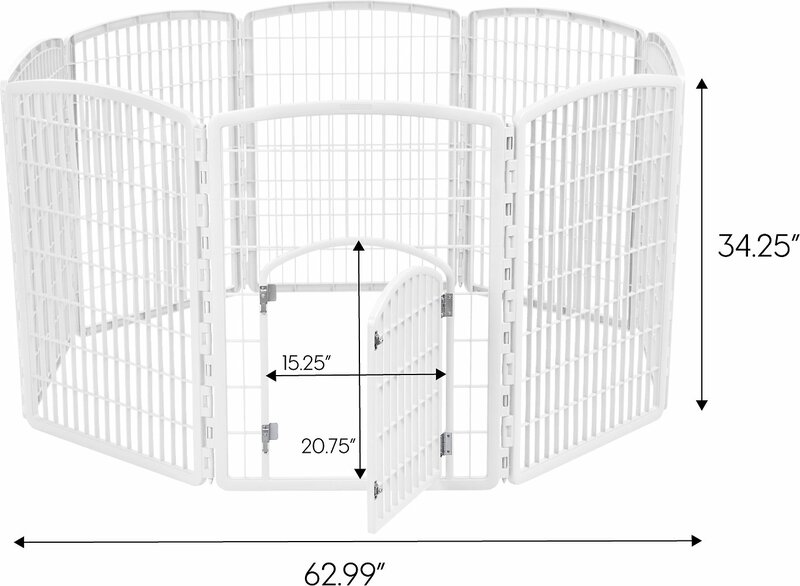 Use it as a play area, exercise space, training pen, or simply to keep your pets safely contained indoors and out. Best of all, it's easy to assemble and easy to clean! Over 21 sq. ft. of space for training, exercise or play both indoors and outdoors. Ideal for puppies during training, or as an area for play, exercise, or safe containment. Made in USA of durable molded plastic that never rusts. Includes non-skid rubber feet to protect floors. Hinged door is designed with double-steel door latches. Use indoors or out to contain your small, medium or large size pets and provide space for exercise, play, or training. IRIS Plastic Playpens are a great way to safely and securely give your pet needed space for training, exercise or play in the home or out in the yard. Add toys and treats and your pet can have loads of fun within the boundaries of the unit without the added stress of chasing them down. The panels are made of heavy-duty plastic and interlock with full-length connecting rods. Units are available in a variety of colors and come with or without doors to match every household. The secure molded plastic never rusts, it's easy to assemble and to clean. Iris Plastic Playpens are a lightweight solution and a cinch to take a part. They can conveniently move from room to room or to outdoor areas as needed. 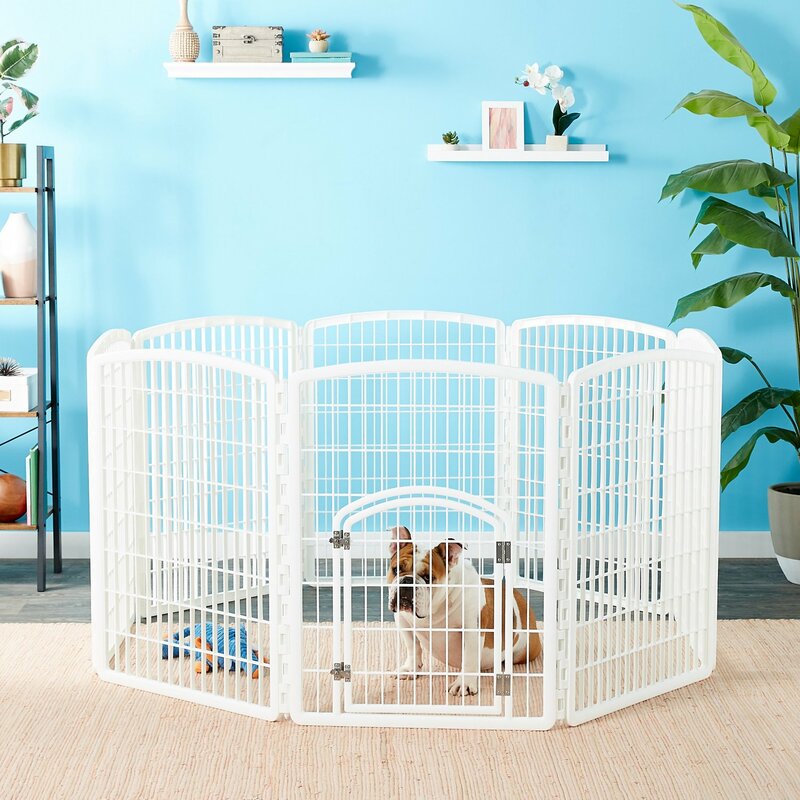 Whether on vacation or in the living room, your pet can romp, play or nap safely inside the playpen. IRIS USA has been producing simple-concept, cutting-edge products in the United States and North America since 1994. They are global leaders in manufacturing high-quality, durable pet products at affordable prices. Excellent purchase and excellent customer service!!! We have two cats that like to go outdoors but we don't want them to run loose. They are used to a leash and collar, but we don't always want to be untangling them. They do well on a runner we have between two trees, but, sometimes, they need to be a bit more contained. My husband made a top for the pen and stabilized the sides and this works great! My only regret is that the price increased quite a bit after this purchase. I wish I had purchased two from the start and we could keep one set up at home and take one when we go camping. I bought this pen for four baby chicks who had outgrown their brooder. They can't go outside yet, and I needed a larger indoor pen to keep them contained, safe, and warm. This is the greatest pen ever. I only used 5 of the 8 panels, but I may need to add another before the chicks are fully feathered and able to be outside. The panels attach to each other easily. It's one of the best purchases I've ever made. Love it! Exactly as advertised. 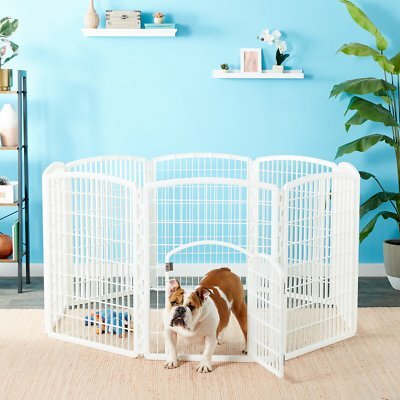 Perfect for our growing puppy, we can add panels as he grows. We use it as an indoor “bedroom” for our Tugg, it’s big enough for his bed and blanket and several toys. Latches are strong enough to keep this German Shephard in at night and while we’re out. We have a 7 month old Rottweiler puppy. We are using this in our Cabinet shop so we can bring him to work with us. I read reviews on the wire pens and they said they will topple over if they are jumped on. That is when I decided to buy a heavy duty plastic one and it works great! He jumps up once and awhile onto the walls of it and it barely moves. He also really likes the door. This is a lovely 'house' for our Bichion. We never were consistent with his 'potty training' and decided to get his beautiful pen to start over. It is bright, fits in well in our home and is portable to take it anywhere. Dexter loves it. I take him out and he runs in and goes directly into his 'house.' Thank you Chewy. this is so awesome!! Very nice quality, will not scratch the wood floors since it has little rubber feet. My puppy is 36lbs at 3 months and he just figured out how to knock it over and get out. Other than him out growing this, it worked awesome! We put him in there when we couldn't play with him. It kept our stuff from being chewed and kept him safe! This thing is nice! Very easy to assemble! Great hight for growing pup! Easy locks. Only reason i didn’t give it five stars, it moves around too easy. When he puts his feet on it or jumps up on it. Would be nice to have some sort of weights that could be attached to the bottoms. But other than that it’s perfect! I got this Pen because my dog had surgery and needed to be kept confined during her recovery. She is a small dog (15lbs) and this is the perfect size for her. Plenty of space and has 360 degree views. Simple to assemble and disassemble. If you need to take it down and store it, it requires minimal amount of space.